One of the most highly-regarded and respected authors and lecturers in the West, Giovanni Maciocia, illuminates and examines the art of traditional Chinese acupuncture with this in-depth look at the secondary channels and other key structures encompassing the human body in Chinese anatomy. This book describes in detail the pathways, pathology, diagnosis, and treatment of the Luo, Muscle, and Divergent secondary channels, as well as other key structures such as the Cou Li and Huang membranes, and gives a thorough, clear overview of subjects poorly understood and incompletely covered in other English language texts. Over one third of the book is dedicated to the Eight Extraordinary Channels, providing the reader with the most in-depth information available in the English language. Drawing on his broad clinical experience, the author covers the energetic physiology, pathology and points by body area, providing ease of access for both the student and practitioner of acupuncture. The Channels of Acupuncture presents comprehensive and clear information on an essential part of traditional Chinese medicine. Giovanni Maciocia has done it again! This fascinating book goes to a level and depth of understanding about the dynamics of Qi and the channel system never seen before in English… Of special note are twelve superb chapters that explain everything a practitioner ever wanted to know about the eight extraordinary channels. This is a must-have book that is bound to enrich the practice of every acupuncturist. 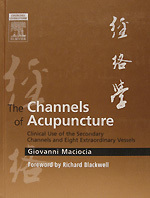 An outstanding reference book that probes and illuminates the classics with Giovanni Maciocia’s own modern insights into acupuncture. This tome is the most comprehensive text available on the acupuncture channels. Giovanni Maciocia has succeeded again in distilling the essence of Chinese medicine… There are many references to his personal experience as a practitioner, yet always from the perspective of a solid grounding in the classics. This book is a welcome addition to the literature available for practitioners as it places acupuncture firmly in the context of the whole practice of Chinese medicine. Aided by numerous attractive illustrations and many quotations, it covers virtually every aspect of channel history, theory, pathways and clinical uses, not just of the primary channels of course, but also of the membranes and fat tissue, the triple burner, the connecting, muscle, divergent channels and the cutaneous regions. This is yet another extraordinary comprehensive book from Giovanni Maciocia.